RED PINS on the Map indicate households with Cancer, Autoimmune disease, or other chronic illnesses. Friday, June 19, 2015 – Texas Department of State Health Services (DSHS) released an Assessment of the Occurrence of Cancer in a select study area in East Harris County, Texas. The report confirmed statistically significantly high rates of the following cancers in children: glioma, retinoblastoma, brain cancer, melanoma, and leukemia. The report also confirmed statistically significantly high rates of the following cancers in people of all ages: brain cancer, cervical cancer, kidney cancer, liver cancer, breast cancer, leukemia, myeloma, and lymphoma. 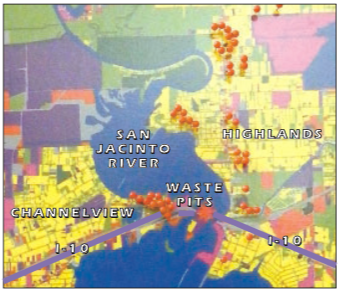 In 2011, the San Jacinto River Coalition began begging DSHS to study the health of Highlands, TX. Though they weren’t sure what was making so many local residents develop cancer, they weren’t convinced that it was all by coincidence. In 2014 DSHS announced that in response to community concerns, they were going to do a cancer database investigation. The leader of the Coalition began assisting DSHS as a community representative, relaying crucial local information that shaped the parameters of their investigation.